I spent a pretty intense four days in Perth this week, visiting colleagues and contacts in the performing arts who might have a connection to my job. 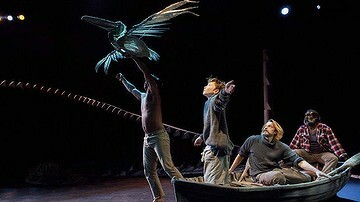 I took in only one performance- Storm Boy by Barking Gecko at the Perth Theatre Centre- at a very crowded and appreciative school matinee. I talked to Perth International Arts Festival, Black Swan Theatre Company, Perth Theatre Company, The Blue Room, PICA and CIA studio residents. I met with Strut, Performing Lines, Proximity festival and PVI. I talked to independent artists Jacob Lehrer, Jo Politt, Sally Richardson and Sue Peacock. I spoke to the Artistic Directors of PVI, The Last Great Hunt, Sidepony, Hydra Poesis and The Duck House. I saw a work in progress showing of NSW choreographer Sue Healey at the studios of Chrissie Parrott and flew on to Adelaide, exhausted and saturated with new information.